For beginners it is often difficult to understand how to best achieve the look, and people often end up asking themselves: how much is “modern” enough? What colors should I opt for? How do I ensure that I haven’t overdone the modern look? Understanding the modern farmhouse look is the first step to getting it right. While most people at the first glance take its white and pristine, clean look for a more “conventional” and contemporary take (and are to an extent right), there’s more to the look than meets the eye. The differences while subtle, can be seen if one is observant. While an interior décor style that is simply modern makes use of more angular and geometric items, a modern farmhouse look is softer and overall demurer. There are no loud accents, so to say, nothing that is too ostentatious, in a modern farmhouse style. The colors used are neutrals and pastels, with dark blacks and blues used sparingly in contrast. Decorative items instead of being flashy and enormous are instead dainty and more delicate looking. Think of a contemporary chic style if your grandma was doing it. It’s less flamboyant and more sedate as compared to an all-out modern décor. 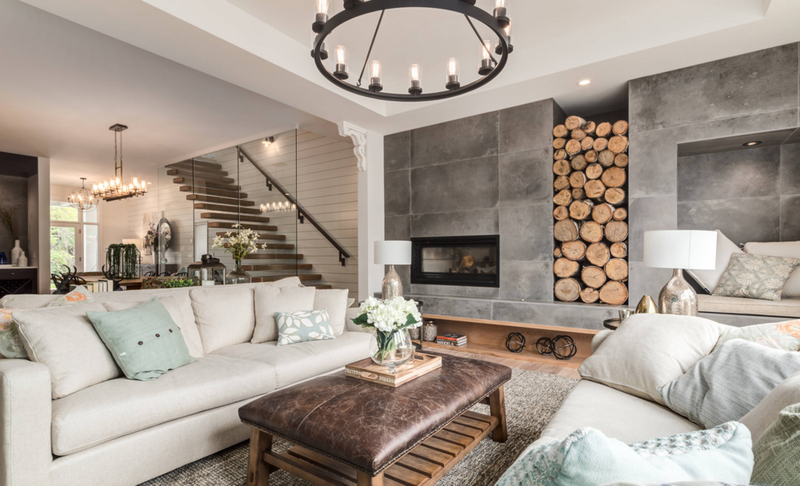 While obviously borrowing its elements of comfort from good old country living, not to mention the rustic accents which help bring an earthiness and natural feel to the whole affair, the modern farmhouse look isn’t exactly the same as a vintage or a classic farmhouse. A classic farmhouse is more of a Moorish affair, made to look as if one was actually dwelling on a farm in some Highlands. The modern farmhouse look makes do with many of the “heavy” elements to be found in a classic farmhouse style décor and replaces it with lighter variants from contemporary chic. Classic farmhouse look also brings with it bright colors which in a modern farmhouse interior are substituted with warm, neutral shades. Instead of an all-wood everything, in a modern farmhouse you can use concrete and stainless steel for a more modern and more practical appeal. As opposed to heavy lighting, in the modern farmhouse look dim lighting is preferred, while the overall spaces are kept neat and spacious instead of cramming them with heavy furniture. Think of a rustic farmhouse without committing to the period: elements like steel, sleek lighting, etc. pop up more frequently in a modern farmhouse interior. Take comfort from classic farmhouse style interiors, flair from modern chic, combine the two and you have the perfect modern farmhouse arsenal at your disposal. From mirrors to botanical paintings and much, much more, we at The Grey Antler have got all your modern farmhouse décor needs covered.